La Cuna Sacred Sites Protection Circle founder Alfredo Figueroa guides a visitor at "The Temple," a Native American geoglyph outside Blythe, California. According to Figueroa, "The Temple" remains on proposed project lands slated for development by Solar Millenium, LLC, and permitted by the BLM. Photo Robert Lundahl. La Cuna de Aztlán, a prestigious indigenous cultural protection group, filed a lawsuit on Monday challenging the Bureau of Land Management’s (BLM’s) decision to permit six large solar energy projects in the Mohave, Sonoran and Colorado deserts of Southern California. The essentially pristine desert region is home to more than 17,000 Cultural Sites. According to the following press release from Studio RLA, the lawsuit is seeking an injunction against all six projects and a Temporary Restraining Order (TRO) to give the Court time to consider the injunction. Six Utility Scale Desert Solar Projects Get Holiday Surprise: Native American group files suit against BLM for failure to consult. BLYTHE, CA. La Cuna de Aztlan Sacred Sites Protection Circle, a prestigious Native American cultural protection group, filed suit Monday in the United States District Court, Southern District of Caifornia, challenging the Bureau of Land Management permitting processes related to six large solar facilities planned for the Mohave, Sonoran and Colorado deserts of Southern California, Case No.10CV2664 WQH WVG. According to Patricia Pinon, Chairperson of La Cuna’s Advisory Committee, the group was joined by CARE, Californians for Renewable Energy, and 6 individual Native American plaintiffs. Pinon indicates La Cuna de Aztlan Sacred Site Protection Circle has standing to sue by virtue of meeting the definition of “Indian Tribe,” according to Section 106 of the National Register of Historic Places, and by virtue of an existing Memorandum of Understanding (MOU) with the BLM. According to court documents, the projects include the Ivanpah Solar Electric Generating Project (Brightsource Energy), the Blythe Solar Power Project (Chevron Energy Solutions and Solar Millenium, LLC), the Imperial Valley Solar Project (Tessera/NTR), Chevron Energy Solutions Lucerne Valley Solar Project, Calico Solar Project (Tessera/NTR), and the Genesis Project (Florida Power and Light subsidiary NextEra™). 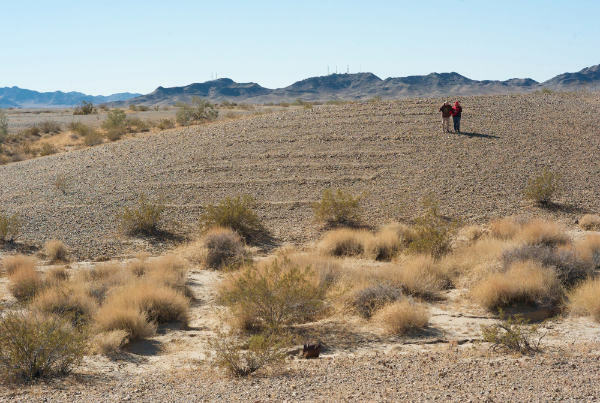 La Cuna founder Alfredo Figueroa states that cumulatively, the projects would grade and develop 23,842 acres of essentially pristine desert lands, designated as class “L” under the California Desert Conservation Area Plan. Class L (Limited Use) lands protect “natural, scenic, ecological, and cultural resource values.The lands are “managed to provide for generally lower-intensity, carefully controlled multiple use of resources, while ensuring that sensitive values are not significantly diminished.” The complaint indicates that each of the projects was permitted with an “amendment” to the CDCA according to the Bureau of Land Management. The suit follows the filing of the Quechan tribe’s legal challenge to the imperial Valley Solar Project which was granted an injunction by Judge Larry Burns on December 15, Civil Action No. ’10CV2241 LAB CAB, United State District Court for the Southern District of California. Robert Lukefahr, CEO of Tessara Solar said at the time, “Tessera Solar is deeply disappointed with the federal court’s ruling last night.” Company press releases stated on December 9, 2010 (prior to Congress extending the time limits for ARRA, American Reinvestment and Recovery Act 30% project cash grants–at the end of the lame duck session–to December 30, 2011) parent company NTR (National Toll Roads of Ireland) had taken a “write down” of 96 million Euros. The Quechan suit further clouds the issues for investors. Now La Cuna de Aztlan’s complaint and request for a Temporary Restraining Order (TRO), giving time for an injunction to be considered by the court, adds another impediment for industrial development of the desert. Following LaCuna’s fiing, the future of 5 additional projects is in jeopardy. At stake also are the region’s unique and invaluable cultural resources. According to the testimony of Elizabeth A. Bagwell, Ph.D., RPA and Beverly E. Bastian before the California Energy Commission, ” This analysis estimates that more than 800 sites (Cultural Resource Sites–Sacred Sites) within the I-10 corridor, and 17,000 sites within the Southern California Region will be potentially destroyed. La Cuna de Aztlan Sacred Sites Protection Circle has an agreement with the BLM to work together to protect Native American sacred sites and cultural resources.